The crisis affecting news organizations around the world has reached the oldest newspaper in circulation in Latin America. 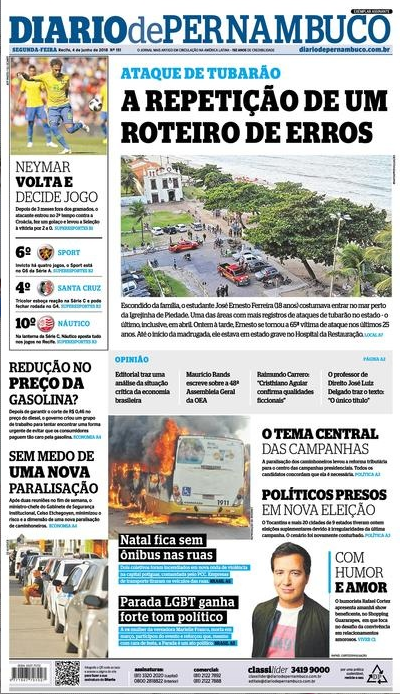 Founded in 1825, Brazil’s Diario de Pernambuco newspaper faces a financial crisis that has cut a third of its newsroom and keeps its employees on edge in the face of delays in the payment of salaries and suspense over the daily’s future. 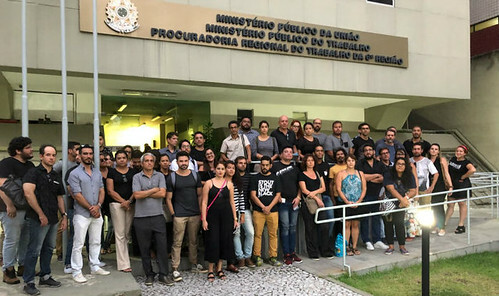 At the end of March, 38 editorial staff members were dismissed, including journalists, designers and photographers, as reported to the Knight Center by Jaílson da Paz, who has been working for the newspaper for 20 years and is vice president of the Pernambuco Journalists' Union (Sinjope). According to a note signed by Sinjope and the National Federation of Journalists (Fenaj), professionals were dismissed in the middle putting together the next day’s edition. "While some were trying to finish the issue, dismissed professionals left the newsroom with applause. For those who remained there was still anticipation about whether their name would be called and the certainty that the DP was emptied of skills while inefficiency reigned in the demolition of a historic enterprise," the entities wrote in repudiation of the dismissals. This was the second mass dismissal at Diario de Pernambuco over the period of one year –12 journalists were dismissed in March 2017. The professionals dismissed a year ago and those recently dismissed have not yet received full compensation to which they are entitled under Brazilian labor law, the journalist said. According to Paz, after the most recent dismissals there were between 60 and 70 people in the newsroom. "When you have a newsroom with almost 100 you already work a lot; with 60 to 70, you can’t handle the load. If you manage to do it, it's not the same standard," said Paz, deputy editor of the Local section. Claudia Eloi, director of Sinjope and employee of Diario de Pernambuco for 18 years, said that today in the newsroom there is an accumulation and deviation of duties, with employees performing activities beyond those for which they were hired, including reporters taking over functions of editors. "People are working 10, 12, 14 hours a day," she said. Supported by Sinjope, the workers of Diario de Pernambuco have already appealed twice this year to the Department of Labor of the public prosecutor's office (MPT, for its acronym in Portuguese) to try to fix the labor situation in the company. At the first mediation hearing on March 16, Alexander Rands, the president of the newspaper, signaled that he planned to cut a third of the newsroom staff and pointed out that the company did not have the money to pay the severance fees, according to Marco Zero. On April 3, at a hearing held after the dismissals, Rands again said he did not have the financial resources to pay full contractual terminations and proposed to pay out the debt with the workers in installments within 18 months, according to Sinjope. The Labor prosecutor responsible for the mediation, Marcelo Crisanto, asked the company to pay within six months, which would be, according to him, an acceptable deadline in Labor Justice. Jaílson da Paz said that the workers and the union plan to present a new appeal to the MPT shortly, in an attempt to accelerate the payment of the indemnities to those who were dismissed and the regularization of the salaries of the employees. According to him, the new project "Diario nos bairros" has yielded significant advertising revenue for the newspaper. Launched in April, this is a supplement that comes out every 15 days with the print edition of the newspaper and is aimed at a neighborhood of the city of Recife, capital of Pernambuco and headquarters of Diario de Pernambuco since its foundation. The supplement features reports from all the newspaper sections and includes ads targeting the neighborhood in question. The workers want the commitment that this revenue will be used for the payment of the people who have been dismissed. "Whoever stays [in the newsroom] gets a piece here, another there, but whoever left has nothing," Paz said. Diario de Pernambuco was founded on November 7, 1825 by the typographer Antonino José de Miranda Falcão in Recife, the capital of the State in Northeastern Brazil. Two years later, in Chile, El Mercurio de Valparaíso was founded, which continues to circulate and fights with Diario de Pernambuco for the title of oldest newspaper in the region. Until 2015, it was owned by the group Diários Associados, founded in 1924 by Assis Chateaubriand, a media mogul in Brazil. During that year, the Hapvida group, through the Sistema Opinião de Comunicação media group, acquired control of the newspaper, soon to sell it to the group R2, of brothers Alexandre Rands, a businessman, and Maurício Rands, a lawyer, Secretary for Access to Rights and Equity of the Organization of Americans States (OAS) and former federal deputy (2003-2012). The two are the current president and vice president of Diario de Pernambuco, respectively. The newspaper, whose print version circulates six days a week with about 26,000 copies, relies on the sale of subscriptions, single copies and advertisements as sources of income. Alexandre Rands told the Knight Center that the newspaper has accumulated almost 30 percent of revenue loss since the end of 2015. The fall in ad sales is the main reason for this loss, especially the decline in advertising spending by municipal, state and federal governments, he said. The president of the newspaper also said that the company was already in poor financial condition when it was bought and the situation worsened with the fall in revenue. "You have to make a big adjustment," Rands said. "The newspaper was formulated for a time when its reach was much greater and we had less sources of direct information, like the internet." According to Rands, after the dismissals of nearly 40 professionals in April, the company's cash flow is balanced, and regularization of payments to employees and full payment of severance to those dismissed are the "priority." "But we need a surplus to start paying those expenses," he said. "We have a number of actions to improve, generate a surplus and have enough cash to pay off what has been accumulated in debt over the course of these months." One such action is the "Diario nos bairros" project. "We are trying to bring the newspaper closer to the population," Rands said. "Our goal is to put the newspaper on its feet and pay the debts, after all, this is a great heritage of Pernambuco, a national heritage, which we cannot let end. So, it's a little civic responsibility to make sure it keeps working." This is a shortened version of the original story in Portuguese. For more detail, click here.